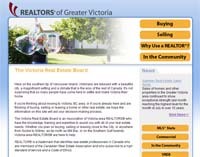 Victoria Real Estate Board Unveils New Web Page | What The Sooke? I am pleased to announce the launch of the newly revamped VREB website, www.vreb.org. The new site offers easier access to key information and guides on buying, selling, leasing, MLS® statistics, commercial real estate and community involvement. Also: Open house information for all open houses being held on the upcoming weekend. Open house listings include helpful Google mapping of properties for easy reference. I hope you will enjoy the site and will recommend it to your friends and acquiantances as a valuable resource in your search for Victoria and Sooke Real Estate.